Summary: Decision tables are an excellent means to represent the decision rules on which an operational business decision is based. But many decision tables are too technical. They are aimed at software developers, not business people. Do they have to be that way? No! Your approach should stay as close as possible to formats intuitive and natural for business people. In this month's column, Ron Ross explains that decision tables are a key technique for business analysis. In this first part of a 3-part series he introduces you to the fundamentals of what you need to know to understand and design business-friendly decision tables effectively. An example of a simple decision table is presented in Figure 1. This decision table addresses the question What coat should be worn? The decision table in Figure 1 can be used to answer four specific variations of the question What coat should be worn?, as follows. What coat should be worn if it is cold and rainy? What coat should be worn if it is cold and not rainy? What coat should be worn if it is not cold and not rainy? What coat should be worn if it is not cold but rainy? The answers can be found in the appropriate intersection cells (for convenience, lightly colored), starting at the top row on the left, then reading clockwise. The answers to the four specific questions above represent four decision rules, which could be expressed as follows. A lined raincoat should be worn if it is cold and rainy. A wool overcoat should be worn if it is cold and not rainy. A coat need not be worn if it is not cold and not rainy. 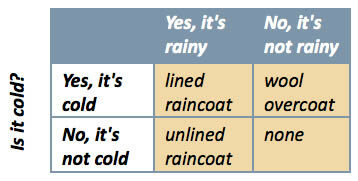 An unlined raincoat should be worn if it is not cold but rainy. A decision rule is a business rule that guides the making of an operational business decision, a business rule that provides a specific answer to a selective question. A significant benefit of using decision tables is that there is no need to write out the decision rules as above (unless desired for clarification). Appropriate outcomes simply appear in the decision cells of the decision table. Lined raincoat is the outcome given by the decision rule A lined raincoat should be worn if it is cold and rainy. Other potential outcomes might exist besides these four. Identifying the complete set of potential outcomes is always an important concern in decision analysis. A decision table is simply a structured means of visualizing decision rules in rows and columns. addresses questions — once generally and many times specifically. provides answers (outcomes) selected from among potential outcomes. A key word in the definition of decision table is visualizing. Decision tables are a means of representing decision rules for viewing and updating in the best (most business-friendly) way possible. Decision tables are not a data management or database scheme — an entirely different issue. Some practitioners — and experts as well — are quite confused on this important point. Not every table, of course, is a decision table. Tables can be used productively for a great many purposes. If a table does not represent decision rules fully the table is not a decision table. What we want from a decision table are the answers to a question. First, however, the decision table must be structured properly to provide and manage these answers in optimal fashion. The most fundamental idea in structuring a decision table is that it addresses particular cases of interest. A case is simply some particular situation — nothing more, nothing less. Cases might be called scenarios, but we prefer the term case to avoid any sense of events or actions — i.e., 'flow'. Think of a case as a snapshot of circumstances that at least momentarily don't flow. It is cold and rainy. It is cold but not rainy. It is not cold and not rainy. It is not cold but rainy. In TableSpeak these factors are called considerations. A consideration is a factor in making an operational business decision; something that can be resolved to two or more cases. How should considerations be worded? Although considerations can always be worded as questions (as above) we do not insist on that. For example, the two considerations above could be called temperature and precipitation, respectively. The key is to word or name each consideration in a clear, business-friendly fashion. How many considerations should a decision table include? The decision table in Figure 1 involves two considerations. Many decision tables, of course, involve more than that. As more considerations are added, the complexity of representation, analysis, and management naturally escalates. It is generally recommended that the number of considerations for a decision table not exceed 7. What kinds of cases can considerations produce? Considerations produce two fundamental kinds of cases, elemental and intersection, as discussed below. How should elemental cases be worded? Elemental cases need not be specified in quite so wordy a fashion as above. For example, simply yes and no would probably suffice. 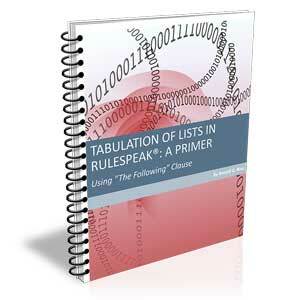 TableSpeak, however, always focuses on avoiding any possibility of ambiguity or misinterpretation. Good judgment in this regard should be exercised. Note that cases are never worded as questions. How many elemental cases can a consideration produce? category of customer might produce three cases — platinum, gold, and silver. province of Canada produces ten cases. zip code or postal code can produce many thousands of elemental cases. Each consideration should always produce at least two elemental cases. A factor that results in only one elemental case (in scope) — e.g., California — can be handled in some better way. Such a consideration might be treated as a scope item or an exception. What quality considerations apply to the elemental considerations? exhaustive (inclusive of all cases in scope). Anomalies can occur in decision tables when these quality criteria are not satisfied. A decision table with only one consideration does not comprise any intersection cases. Since most decision tables involve two or more considerations, however, most do involve intersection cases. How intersection cases are handled is a central issue in structuring decision tables. Part 2 of this 3-part series explains and identifies the fundamental styles of decision tables.